The very far corner of the orchard (where a new gate will be installed) will need to be dug out using an excavator. The ground here rises up for some reason. Originally, there was a large wooden shed here and I suspect that waste was deposited behind the shed. The wall was in pretty bad shape. 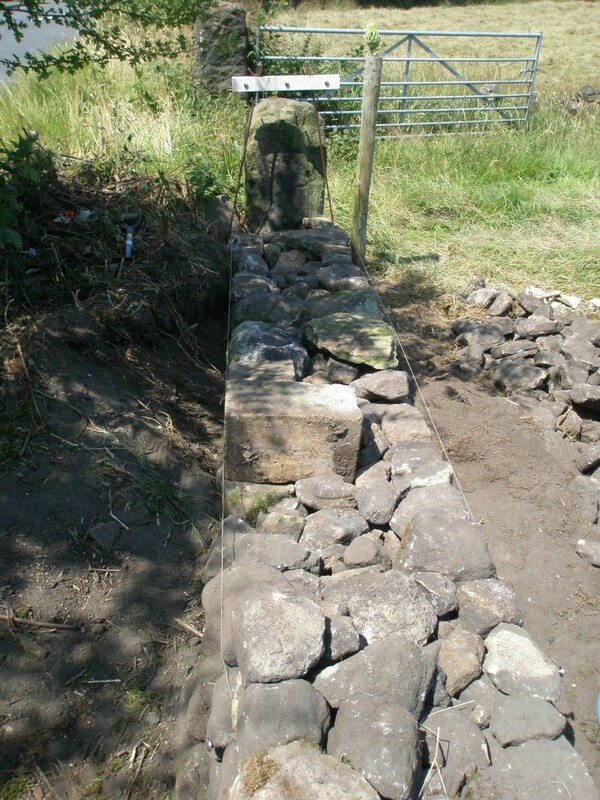 I have pulled out as many of the coping stones as possible and then dug the foundations. Since one side is lower than the other, I can use bricks in the base of one side of the wall base as these will not be seen as they are below soil level. Using bricks is quicker and also means that they don’t have to be thrown in the skip. 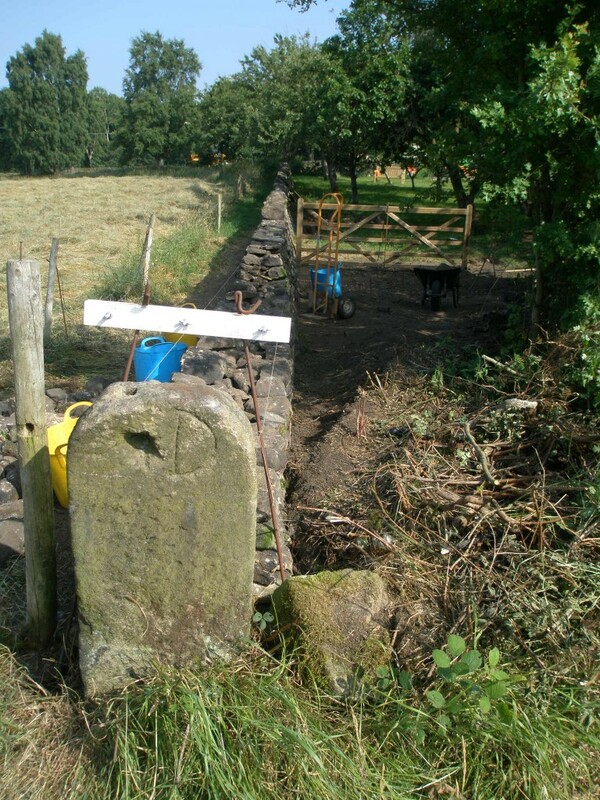 The last section of the orchard wall has been started. A gate will be installed here roughly where the blue trug is. 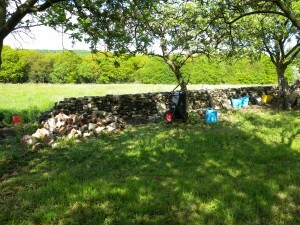 I am starting to lose track of the days that have been spent on the dry stone wall in the orchard. I am tending to work on the wall in between doing other things, so very few of the days are dedicated to just building the wall. It would be misleading to say that this is day 33. I am just about to start digging out the next 3-5m section. I doubt that I am going to be able to build much more until the bottom end of the orchard has been dug out. At the moment, the land rises up and is a good 2ft higher than the road level outside. No doubt this is the result of years of rubbish and undergrowth behind the shed that used to be here. The plan is to use a mini digger to reduce the soil level at this end of the garden. Then we can carry on building the wall. The builders have offered to show me how to use the mini digger, so this could get interesting! There is going to be a gate at the far end of the orchard, but I am not going to be able to go much further. Only about another 10m or so to go in the orchard. Over 30m now completed. 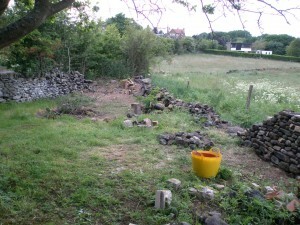 In preparation for this, I have strimmed the edges of the fields pulling out all of the large stones. The grass mower on the tractor seems to act as a magnet for all the stones. 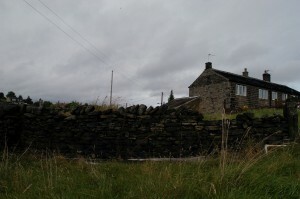 This seemed like a good time to have a look at the pile of rubbish next to one of the lower dry stone walls – large amounts of wood and old gutters, two ancient tractor tyres and some plastic crates. Once this had been removed and taken to the dump, it was time to have a look at the wall. It only took a couple of hours to tidy it up and hopefully this will stop any further deterioration. 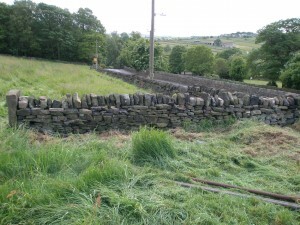 Looking at the photos now, the right hand edge of the wall (the one nearest the gate post) seems to dip a bit. I will need to fix that tomorrow. Weather permitting. 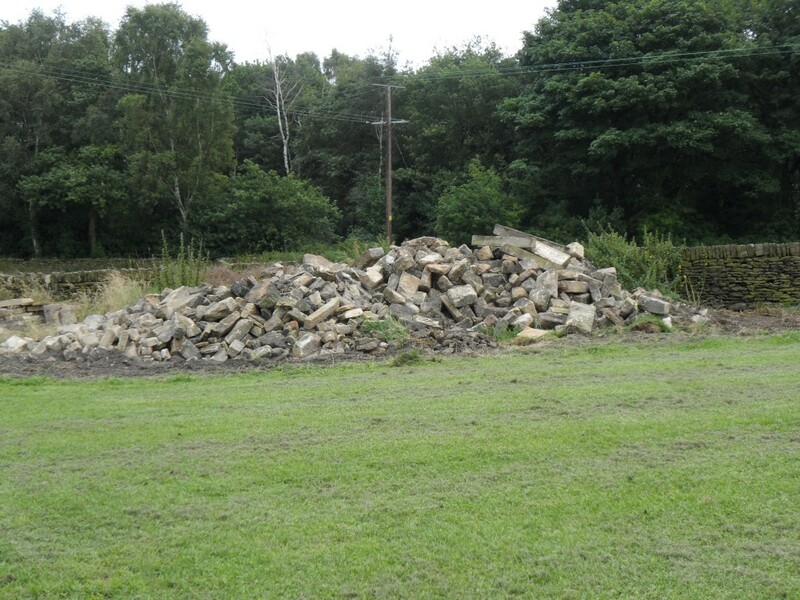 The wall in the bottom field had quite a bit of rubbish piled up against it. The rubbish has now been removed and the wall has been repaired. It looks a bit scrappy from this side, but it just needed to be repaired to make sure that it did not collapse any further. Taken September 2012 before we had started any of the renovations. 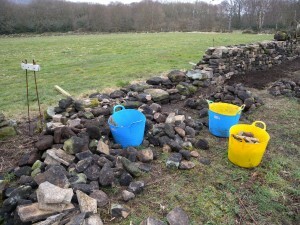 The weather at the weekend was fantastic and we spent most of it working on the dry stone wall in the orchard. By the end of the second day, another 5 metre section had been completed. It is much quicker with two of us! 30.5m done. 17 to go. In the orchard anyway! A weekend of fine weather sees another 5m section completed. 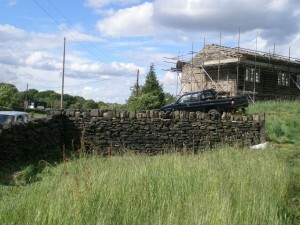 Allbeit, without the coping stones. We had three great weather days in a row – and over a Bank holiday too! 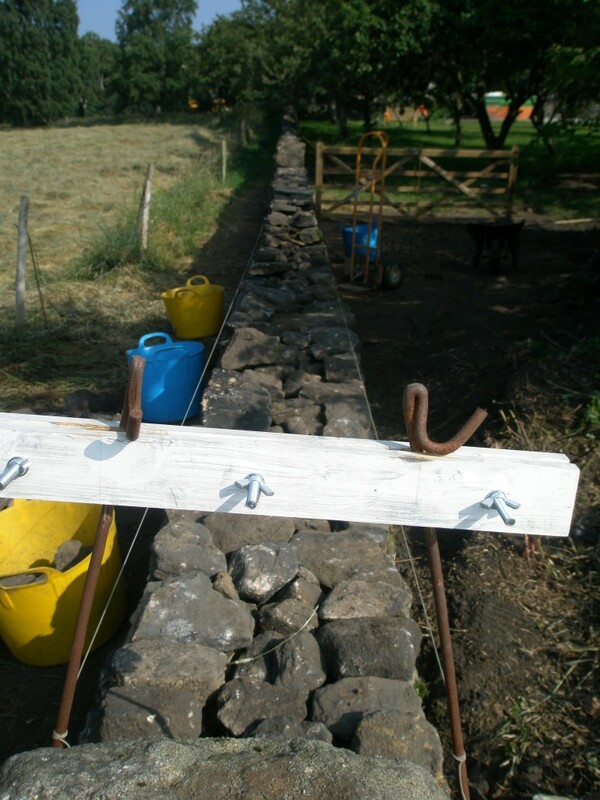 We have now completed 25.5m of wall in the orchard with only another 22m to go to! 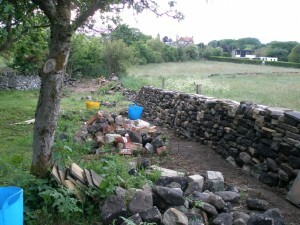 I guess we must be approaching the half-way mark with the dry stone wall in the orchard. Must be time for a photo. Here’s a (slightly messy) panorama of the progress so far. 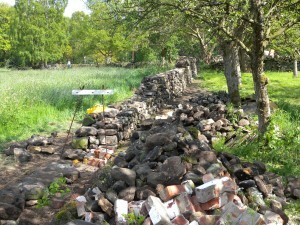 This is the current extent of the rebuilt dry stone wall in the orchard at the end of day 23. Well, the weather over the Bank Holiday weekend has been great so far. With any luck we will end up with 3 good days on the trot. Difficult to believe when Friday’s weather was so cold and wet. 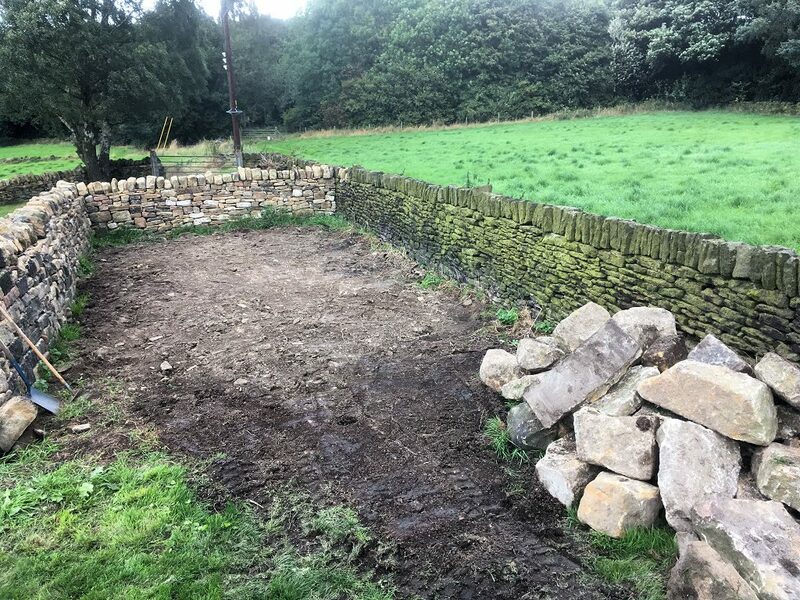 With most of the work done inside of the cottages and the builders due to start next week, our attention has turned back to the dry stone wall in the orchard. It is a real pleasure to work outdoors in such fine weather. With two of us working on it together, we have made significant progress in the last couple of days. The wall at the start of day 23. End of day 23. 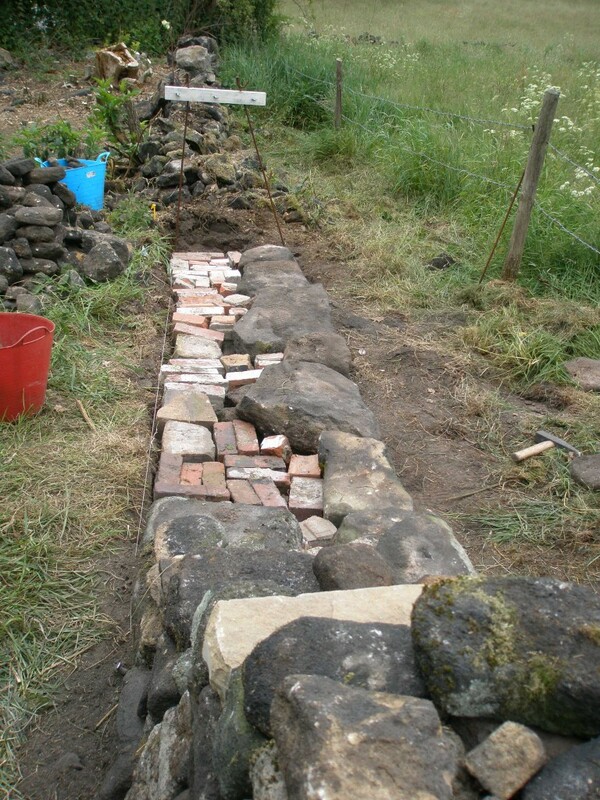 The wall closest to us has just foundation stones, the next section is about 50cms high, the next section is complete but without coping stones and the wall furthest away has coping stones. 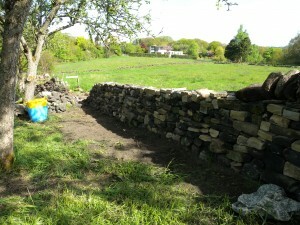 Another Saturday dry stone walling, but this time it was in the sun! It was a beautiful day here in West Yorkshire, although the wind and the rain did set in later in the afternoon (but we were ready to pack up by then!). 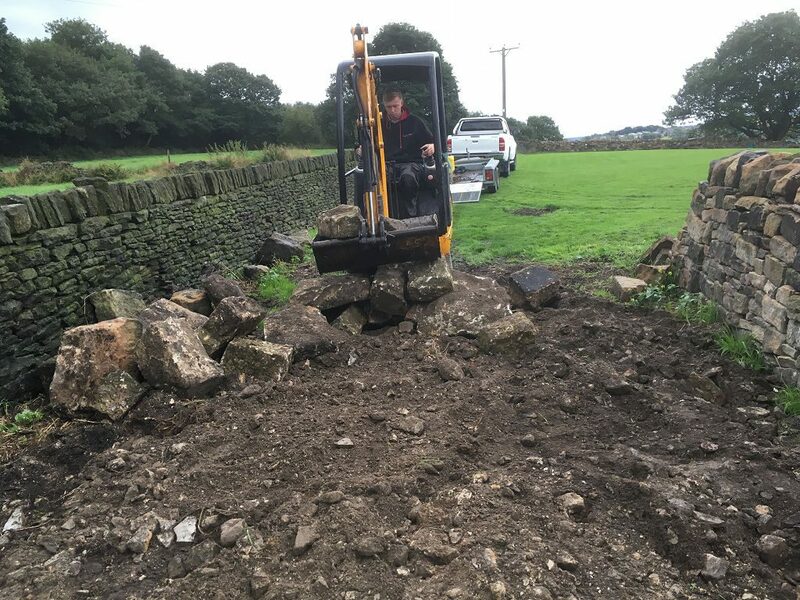 We disassemble the next 3M section of wall and dug the foundations. The photo below show how far we got during the day – probably about 5 courses up. This means that one side of the wall is just above ground level (this side of the camera) while the other is showing a number of courses (the other side of the wall). Another 3m section dug out and foundation stones laid. I am not too keen on this part of the building process as it always looks a mess at this stage. It does improve as the wall appears from the ground.